Here’s a talk by a robotics professor at Carnegie Mellon who worked on autonomous cars at Uber ATG. What’s changed in this architecture between the DARPA Urban Challenge in 2007 and today is the use of deep learning for perception and prediction. So maybe a more accurate name is the semi-classical architecture. You go from sensor input to actuator output with one big neural network in the middle. You train the network via imitation learning using human-driven miles in the autonomous car (or potentially via reinforcement learning in simulation). Jeff Schneider talks about Uber ATG’s experiments with this in the talk. If you want to make the problem hard, force it to start from the camera image. … But, again, we have the option here to start small. We can take the existing perception system and just work on the motion planning system to start with. So, the important difference between the semi-classical architecture and the mid-to-mid architecture is that in the mid-to-mid architecture the vehicle’s decisions about what actions to take are handled by a neural network, instead of hand-coded software. The action neural network is trained with a) imitation learning using data from human driving, b) reinforcement learning in simulation, or c) both. I may not have all the terminology exactly right (particularly “mid-to-mid” vs. “end-to-end”), but I think I have the general concept right. As far as I know, no major company is actively pursuing an end-to-end architecture that goes directly from sensors to actuators. But Waymo, Tesla, and Mobileye (33:10 to 46:15) all seem to be pursuing a a mid-to-mid architecture where the perception neural network’s output is the action neural network’s input (and the action neural network’s output is the classical control algorithm’s input). Schneider doesn’t actually say what architecture Uber ATG is pursuing, except that it’s not an end-to-end architecture. If Schneider’s views reflect the majority view of technical leads at the company, I would guess Uber is working on a mid-to-mid architecture. 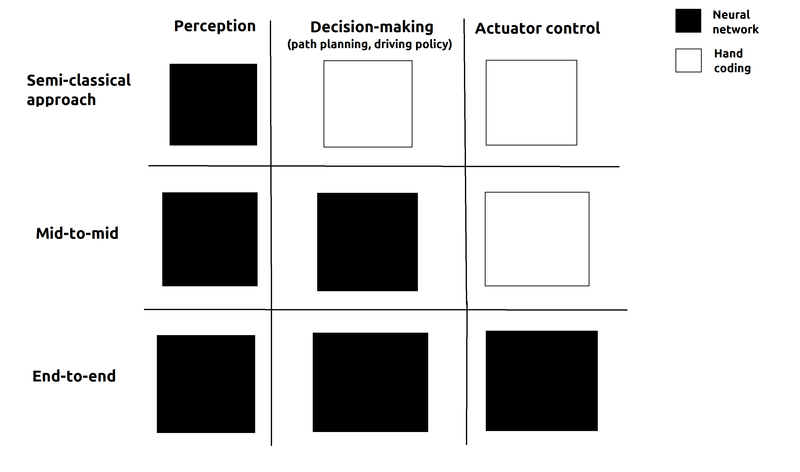 Big picture: some of the major self-driving companies are coming around to the idea that a self-driving car’s actions should be decided by a neural network trained via imitation learning and/or reinforcement learning, as opposed to hand-coded software.